The countries I included in the first chart made up 68.4% of the global market cap in 2000 and 71.1% in 2016. 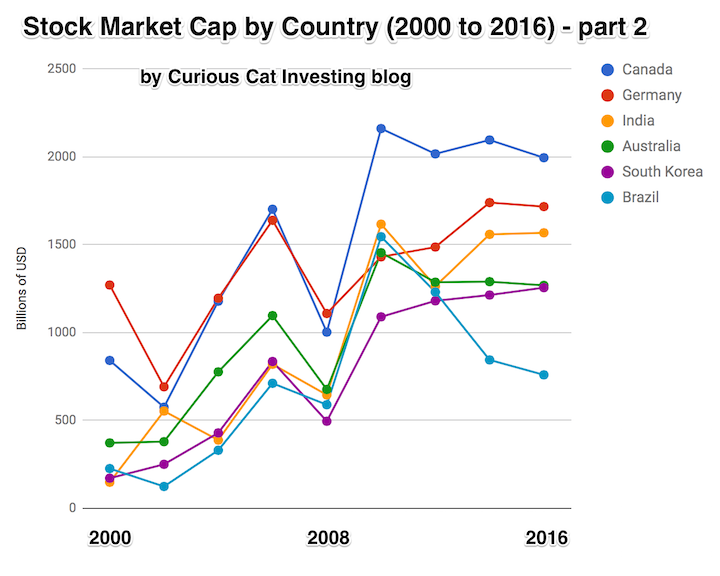 The chart shows countries outside the top 5 based on stock market capitalization, with data from 2000 to 2016. The chart created by Curious Cat Investing and Economics Blog may be used with attribution. Data from the World Bank. One way to view the dominance of mega-companies is that the market cap for the top 4 stocks exceeds the market cap of all of Canada’s stocks (Apple $807 billion + Alphabet $687 billion + Microsoft $588 billion + Facebook $507 billion = $2.589 trillion). The next, Amazon $477 billion, bring the total for the top 5 to over $3 trillion. Something like the 8 most valuable Chinese companies would also exceed $2 trillion (including: Tencent, Alibaba, Industrial and Commercial Bank of China and China Mobile). So this second chart is interesting for looking at the performance of stock markets in other countries but remember how small these are compared to the global market cap. The 7 countries included on this chart made up 13.9% of the global stock market cap in 2000 and 16.5% in 2016. The countries included are not the next 7 exactly (I don’t include Switzerland (which would actually be above the last 3) or Netherlands or South Africa (that beat out the 2016 market cap of Brazil by a little bit). In this second chart India’s performance is the country that looks to me to be most deserving of attention. They have many strengths economically and many challenges. The next 10 years will be very telling for how rapidly they continue to improve economically. Another important take away from this post is how much the large USA companies really represent investing in global prosperity. Local companies will benefit from the continued global economic gains but the huge USA companies will likely continue to do well also. It will be interesting to see how Chinese companies can adjust and seek to directly interact with consumers in other countries (so far much of China’s growth has been indirect [manufacturing for Apple…] or internal Chinese growth). There are some institutional challenges for Chinese companies seeking to make this transition so it will be interesting to see how that plays out. On a small scale even this broad data can show that certain countries have success in the globalized world. Singapore’s market capitalization continues to grow impressively. And this is largely due to the ability of Singaporean companies to prosper in SE Asia and beyond. The data also show how quickly entire countries can slip – Brazil and Turkey show this dramatically and Mexico is also suffering (the shocking violence continues to be a huge drag on the country). To a lesser extent Malaysia’s strong performance has tripped up the last few years. The South Africa and Indonesian markets have been performing well but like so many others in similar positions they feel as though even small problems can create big economic risks (the economies are just not robust enough to handle negative shocks well). There is a huge change when a country can reach the point where negative shocks can be absorbed fairly well. That requires many different aspects of the economy to be strong and a stock market with many strong companies are a huge help in achieving this state. 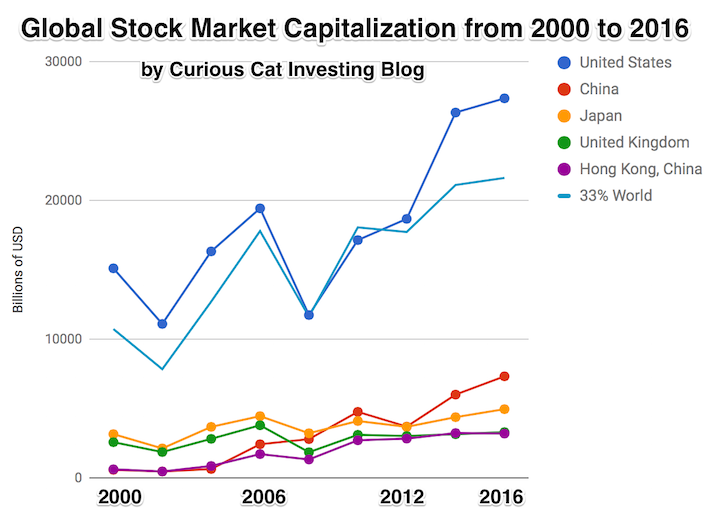 I would not be surprise to see a collection of the lower stock market capitalization countries increase in the next 20 years at rates higher than the largest (so countries like South Africa, Thailand, Mexico, Malaysia, Ghana, Indonesia, Philippines…). I would be surprised if some of the smaller countries don’t do poorly but some will likely do fantastically well and over-shadow the poor performers (from a global investors perspective). I believe China will likely do well (while being volatile). The USA also has a chance to do very well – largely due to the international performance of many of the companies based there. The USA did many good things over the last 60 years (the smart decision by the USA in the 1950s and 1960 to push science and engineering as well, for example), but probably more of the reason for the USA’s success was the bad policies elsewhere. Today many countries in Asia and Europe are better focused on the value of science and engineering than the leaders in the USA are. The USA is coasting on the huge science and engineering infrastructure built and nourished earlier. The huge advantages of the richness of the USA are overlooked far too easily. Just coasting off that wealth allows pretty mediocre policy to result in continued prosperity for the USA and that will likely continue. The data source I used for this post is from the World Bank and is a very well done web site [sadly the very good user experience (Ux) design found on this web site is rare]. The World Bank deserves praise for how well they have done with this web site. Even so there are oddities, such as no data for UK after 2010, so I use the value on UK data for 2012 and 2016 are not available from World Bank so I am using here for 2016 and made a guess for 2014. * Market capitalization (also known as market value) is the share price times the number of shares outstanding. Listed domestic companies are the domestically incorporated companies listed on the country’s stock exchanges at the end of the year.